At the time of the restoration the Revd D. G. Trustram was the Parish Priest, The Church treasurer was Mr, W.D. Clague and the secretary was Miss P. J. Morgan. The Total cost of the restoration was £16,995 and the sum was raised from grants totalling £9,100 and donations totalling £7,895. 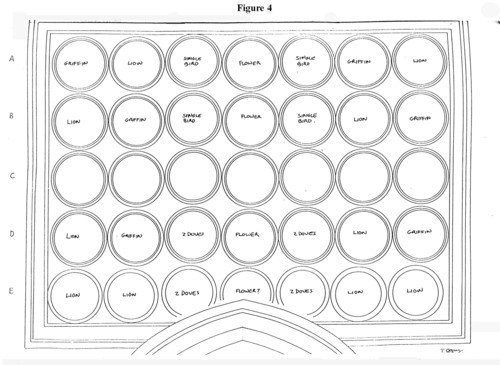 13th Century decoration over the Chancel Arch: medallions forming background for the Rood Screen occupying an area of 2.75m x 3.50m. Created using the Fresco technique using the following pigments: yellow and red ochre, vermilion, black, limewhite. Incisions were made in the medallions. Workmen uncovered the 2 lower rows in 1869 and the upper 2 rows were uncovered in 1903. A wax-varnish coating and over painting were performed at the time. 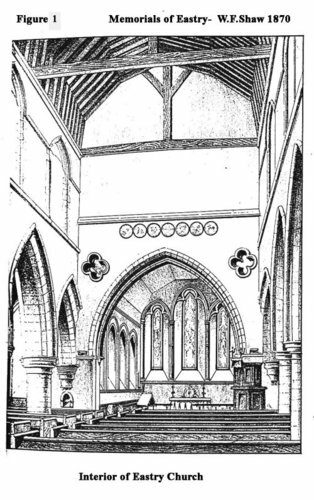 In 1857 "There was some modern panelling on the west side of the chancel arch. Behind it and underneath many coatings of whitewash, was discovered much painting in fresco. The whole wall appeared to have been originally blue studded with gold stars. On a later coat of plaster were the circles containing the early Christian symbols, which are at present to be seen above the arch. There were many other circles with similar designs, which were covered over again on account of their very indifferent condition, as well as being mere repetitions of those preserved". "The Church is generally in good structural condition and we have just completed a contract of repointing and stonework repairs working with English Heritage. The heating is by oil fired hot water boiler and radiators. The glazing and rainwater disposal is generally in good condition. Ventilation – there is provision for some opening vents but these are apparently not used. The cracks in the Chancel arch either side of the wall painting have been repaired and made good. Now that the structural weakness in the Chancel arch has been stitched and repaired, there should be nothing endangering the wallpainting". “Cleaning, removal of wax-varnish layer, overpaints and lime wash left overs; Consolidation and repair of plaster; Reintegration of losses”. Trefoil Flower with four leaves springing from a central stem-possibly a lily, symbolising the purity of the Virgin Mary or the flowering rod of Aaron. Often found on 13th century glass and tiles. Common in Christian symbolism- the Holy Spirit or Christian Soul, the Trinity, the Annunciation of the Virgin Mary, Purity and Baptism (John I:32 -“I saw the Spirit descend from Heaven like a dove”). Symbol of Christian courage, the Saviour and the Resurrection (in natural history legend young lions are born dead and after three days are brought to life by their sires), also it is the sign of St. Mark. Rare in Christian symbolism -pagan symbol for the Evil One. The Lion and the Griffin are always shown facing each other as if in confrontation, though with no sign of hostility. This subject also appears on the Old Font in Lincoln Cathedral and on tiles in the chapter House of Salisbury Cathedral. The Old Font at Winchester Cathedral contains carvings of a Lion passant and two birds drinking from a vase. All the subjects fill their space within the medallions completely -feet rest on the circular borders and heads, necks and tails follow the curves of the borders closely. “The Fresco must be earlier than the present Chancel must be earlier than the present Chancel Arch, which was heightened in the late 1200s. The most likely dates are either about 1200 (The major rebuild), or 1230-1240 (the date of the Quatrefoil / Trefoil aperture and Chancel), ore perhaps, early 1100s neat the date of Bayeux Tapestry. Examination of the Chancel Arch indicates that it has been raised by being made more pointed to agree with the Early English style and perhaps to improve the view from the Nave where the lay people stood. Although “the weakest went to the wall”, there were benches to sit on”. Original late 11th - early 12th century wall made of flint with a coarse lime/ sand mortar with a high shell content. The wall was about 8 m high, finishing with a barrel shaped ceiling about 45cm below the level of the present tie beam. 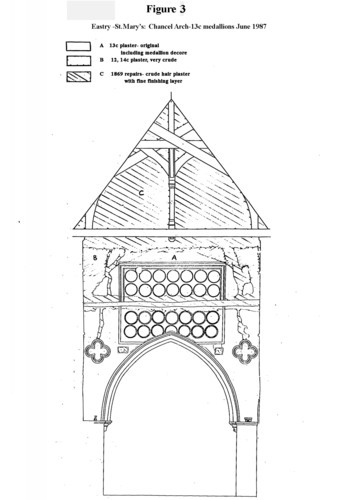 The original tie beam rested on the ledge, which is still visible above the chancel arch. In the 13th century the chancel was probably rebuilt and the present chancel arch and two quatrefoil openings were inserted. 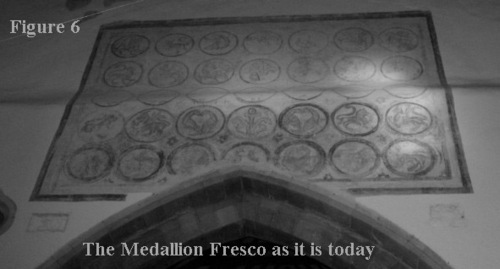 It seems probable that the medallion frescoes were executed at this time on new plaster, the tie beam having been cut back to a gentle slope. The flint wall was replastered with an arriccio of lime / sand plaster (5-7mm) and a fine lime / sand intonaco (1-3mm) . The intonaco showed many brush marks over its surface, possibly a result of attempts to make it more even. It also contained the incisions and compass marks used in the execution of the fresco. The wall and arricco are sound. 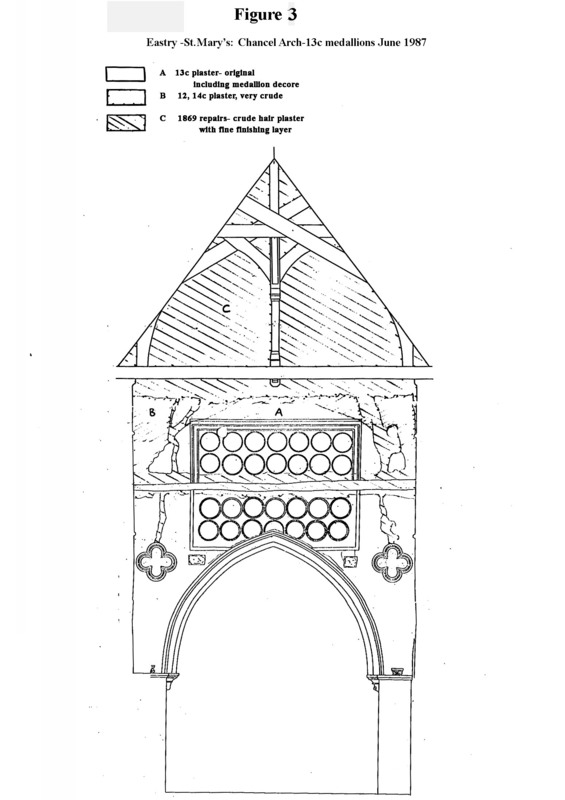 Two large structural cracks run up the wall from the quatrefoil openings . These and the ledge were filled and replastered in 1869. There are numerous small losses of intonaco, including some larger holes in the upper centre of the painting. Row A: covered with thick dirt, dust and remains of later lime washes. Row B: The many small losses of the intonaco must have happened early on as they contain all the later lime washes. The background around the medallions has been overpainted with an ochre distemper with the most recent grey emulsion starting at the outer border. Paint loss is generally due to plaster damage, although the black outlines and vermilion border have disappeared in many places, the red underdrawing now indicating the form. Row C: Has been destroyed. It was originally painted on the now replastered ledge. Some compass incisions and red ochre borders were found above and below the damaged area during removal of the 1859 plaster and ochre distemper. Row D: Is covered with thick dirt, dust and discoloured wax consolidant on the medallions. Areas between the medallions were overpainted with ochre distemper, two small “diamond” shapes are left below the central medallion. There are numerous traces of later lime washes, often in losses of the intonaco, in some cases calcified to a hard layer. A row of nails runs the length of the painting which once held the canvas Decalogue, removed in 1869. The subjects of the medalllions are in relatively good condition although again the black outlines have often gone and the vermilion border has discoloured to dark brown. The best preserved traces are of “diamond” shapes and the sixfoil floral motif between the medallions. Row E: Is in a more damaged condition. The medallion subjects are often only discernible by the incisions in the plaster or the red undercoating. The central arch cut into the three central medallions, and traces of the paint extend onto the stone. Traces of white highlights were only found on the lion E7. The Sixfoil Floral Motif is vermilion, which is mostly discoloured and covered by ochre distemper except between rows D,E-3,4,5 where they are waxed (they appear as diamonds because of surrounding distemper -see Figure 2). They have been mostly destroyed, although some are visible between the lower rows, covered by a calcified layer. The Outer Border: Very dirty- covered along the inner ledge by ochre distemper and along the outer layer by grey emulsion. There are many small losses to both the pigment and ground. Later limewashes left on the surface after the original uncovering have been retouched in orange on both the yellow and red bands, especially along the lower bands. The Inner Border: Very faint and dirty -around rows D and E it is covered by ochre distemper. Some areas of the intonaco are damaged. The Imitation Tapestry Pole: Very dirty with loss of the paint layer increasing towards the centre due to plaster damage. Plaster Surrounding the Medallions: covered with grey emulsion paint. This also covers the broken corbels on the left and right sides and hides the many limewashes and plaster repairs. The distemper layer lies beneath the emulsion and covers everything except for the medallions and borders. This is the Flint wall extending from the height of the Norman roof to the height of the present roof. It is covered with crude 13th-14th century lime / sand plaster with a high shell content. Numerous small lumps of lime and fragments of wood indicate careless preparation. The application is very uneven. The condition is generally sound although in some areas the plaster is damaged. Cracks extend up from the quatrefoil openings. There are many layers of lime wash. Some of these contain traces of decoration in red and black, including fragments of text , which are comparable to 18th century cartouches on the Nave N wall. The surface is damaged in many places and covered with ochre distemper and grey emulsion paint. There are two layers of plaster-a coarse lime / sand / hair plaster and a finer lime / sand finishing plaster. It is sound with a hard even surface . There are names incised along the north rafter: A.Ford 1957…1957 , D.J.C. Hagler 1957. The ochre distemper is covered with grey emulsion. Both layers are in sound condition. The surface dirt and dust was brushed off. Grey emulsion was removed mechanically and with NITROMORS. The ochre distemper was removed with a mixture of Water/ Methylated Spirits/ LISSAPOL (90:5:5) using soft brushes and scalpels. The lime wash leftovers and hard calcified layers were removed with scalpels and glass fibre brushes without the need for solvents. Plaster repairs carried out in 1869 along the ledge and in two large cracks were removed. Some small areas of plaster were consolidated by injecting Calcium Caseinate / Water / Methylated Spirit as a wetting agent. Deep holes were first filled with coarse sand / lime plaster (3:1) up to 1mm below the surface level. Fine filler stonedust / lime (2.5 :1) was then applied up to the surface level. This mixture was also used to repair the many losses to the intonaco. Stainless steel ties were embedded in the wall with hydraulic lime / sand mortar to strengthen badly cracked structure above the quatrefoil openings. 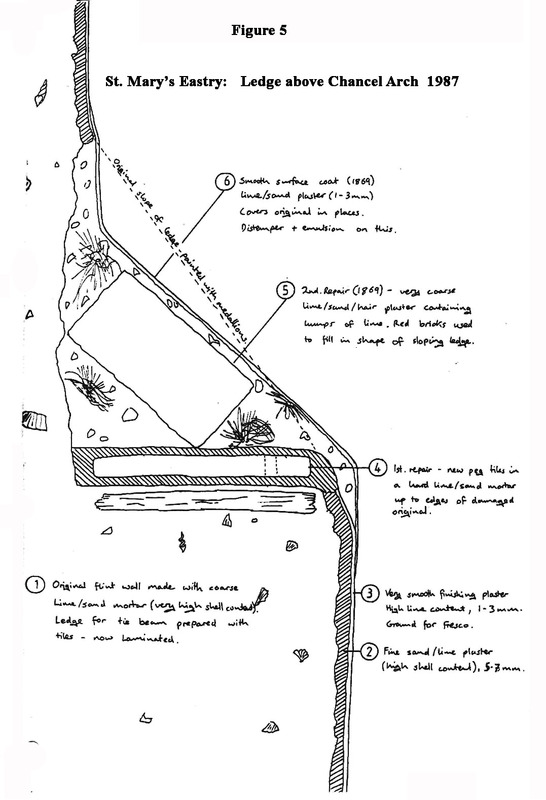 Cracks were filled and the ledge was replastered to recreate the original form (see Figure 5). Fine filler was applied to match the surface texture. Limewashes and plaster fills surrounding the medallion decorations were retouched in a buff colour using powder pigments bound with CAPAROL water-soluble emulsion. Small losses in the original design, mostly the borders, were retouched with WINSOR+NEWTON watercolours, using trateggio on the fills. 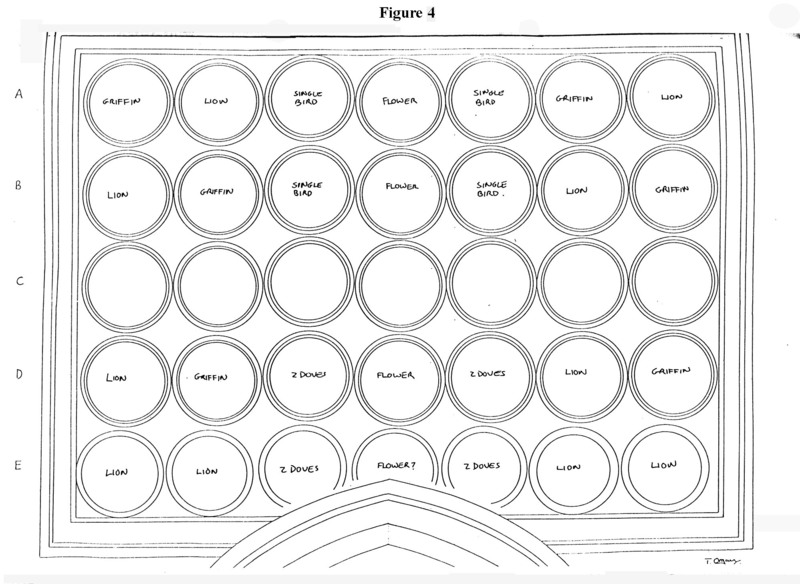 The circular forms of the missing medallions in row C were indicated in red, after being incised in the fresh plaster.